Can be used when the ignition is switched ON. Use this switch to turn on the front fog lights. The front fog lights will improve visibility at night and during foggy conditions. position before turning on the front fog lights. The front fog light indicator light in the instrument cluster illuminates while the front fog light are on. 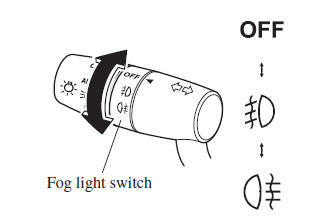 Rotate the fog light switch to the position. Turn the headlight switch to the position. Switch the ignition to a position other than ON. front fog lights will turn on when the headlights, the exterior lights and instrument panel illumination turn on. automatically), the rear fog light will also illuminate, and the rear fog light indicator light in the instrument cluster will also illuminate.